In recent months, skincare is something I’ve become really passionate about. If I’m honest, the way I treated my skin was something I never even gave a second thought to in the past. It was only when I started getting waxes that I really began taking any notice of it. However, I’m so glad I did; after all our skin is the largest organ in our body! Skincare has never been a simple task for me, as I get a type of dermatitis which generally flares up when I’m stressed or react to a product. Sometimes, I can deal fine with a product for ages, but as soon as the dermatitis is triggered by stress, the product also becomes no good, so it can be a real pain. After a lot of trial and error, I seem now to have found a skincare routine that works for me and makes my skin feel amazing! In the morning I simply wash my face with cold water. I can’t remember where I read this tip, but it’s really worked for me. I definitely believe it’s possible to use too many products, which is why some cold water to rinse my face and wake me up is all I think I need in the morning. Another plus side to this is it saves money and time – an extra 10 minutes in bed is always a bonus! If I’m going out, I make sure to wear a primer with SPF under my makeup (my favourite is Rimmel fix and protect with SPF 25). Simple Micellar cleansing water – Granted, this isn’t ideal because I prefer to use more natural products, however Simple Micellar water has always been a godsend for me. It’s a really easy way to get my makeup off and as it can be used on the eyelids as well, is nice and quick. If I’m not wearing makeup I skip this step. 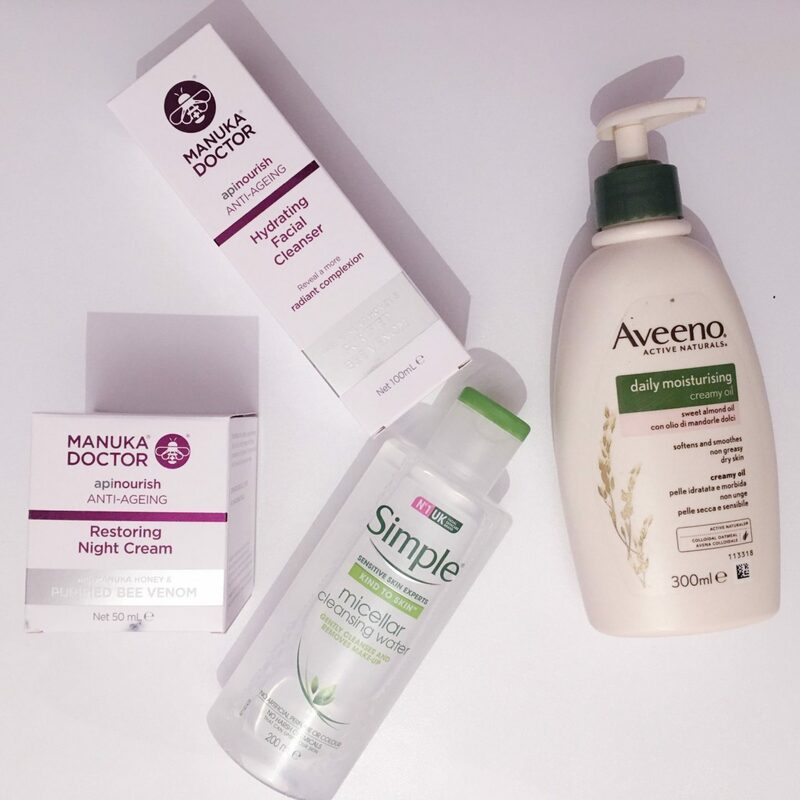 Manuka Doctor hydrating facial cleanser – I only recently starting using Manuka Doctor, and it’s honestly ah-mazing! It is a little on the expensive side, but not silly money, especially as it’s often in the Holland and Barrett penny sale (buy one get one for a penny). In addition, as long as you’re reasonably conservative with the amount you use each time, it lasts a good while. This product smells absolutely gorgeous and cleanses the skin really well. The only problem is, Manuka Doctor products are no good if you’re allergic to bee stings, as they contain purified bee venom. Manuka Doctor restoring night cream – This is probably my favourite product of them all. I massage this moisturiser into my face in small circles when I get out of the bath. It leaves my skin feeling so soft and nourished, and again smells delicious. The first time I bought the night cream I was disappointed at how small the pot was, but it lasts really well – probably even better than the cleanser. Aveeno Lotion/Creamy oil – This is the moisturiser I use for the rest of my body. Aveeno moisturisers are absolutely lovely and at £5-£8 a bottle are really affordable. I apply this as soon as I get out the bath, when my skin isn’t completely dry. I try to be as quick as possible; it’s best to get moisturiser on within 3 minutes of getting out the bath/shower, so the skin doesn’t loose moisture. Generally, I just dab my skin with a towel to take off excess water and slap this stuff all over as fast as I can! I’ve always used Aveeno lotion, however recently tried the creamy oil which smells lovely and is absolutely gorgeous, especially if you have dry skin like me. The only issue is my puppy apparently likes the taste of it, and constantly tries to lick my legs after I’ve put it on! I also make sure to gently exfoliate my entire body twice a week using exfoliating gloves. This is great for the skin and really effective for preventing ingrown hairs – just make sure to moisturise really well afterwards, and don’t overdo it! I find twice a week is plenty when it comes to exfoliation. In addition, I make sure to always drink 2 litres of plain water per day. I really do swear by the benefits of drinking plenty of water, as explained in one of my first ever blog posts. If skincare is something you don’t think much about (as I didn’t for years) it’s really worth looking into. It’s amazing how good something so seemingly insignificant can make you feel. Like I mentioned earlier, your skin is the largest organ in your body, so skincare really is a great form of self-care. There’s no real right and wrong when it comes to taking care of your skin, it’s simply a case of finding what works best for you. We’re all unique, and everybody’s skin has it’s own needs. Your skincare routine needn’t be expensive or time-consuming, but it really has the power to make you quite literally love the skin you’re in!